I have learned a lesson, folks. When a good friend of yours, who also happens to be a total book nerd and a writer, tells you that you need to go down to Charleston, SC for an event all about YA books . . . you listen! 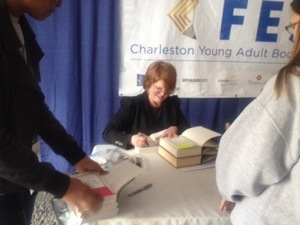 So this past Saturday was YALLFest, an annual YA book festival. Seriously, if you live ANYWHERE near Charleston, make plans to go to this next year. Start saving up now. Speaking of saving up, I should mention that most of the stuff there is FREE! I went to five different panels to hear a bunch of different authors speak on a variety of topics, from the draw of dystopian stories, to why fantasy and teen lit in general don’t get as much respect, to the importance of tackling difficult topics even though it might get your book challenged. And who all was there, you may ask? A TON of amazing authors. Rainbow Rowell, Stephanie Perkins, David Levithan, Ellen Hopkins, Gayle Forman, Kami Garcia, Margaret Stohl, Veronica Roth, Lauren Oliver, Ransom Riggs, Tareheh Mafi, Ally Condie, Lev Grossman, Carrie Ryan, Libba Bray, Rachel Cohn, and a whole bunch more that I can’t remember because all my stuff is downstairs. I think there were 48 total? Completely overwhelming, in the best way possible. A highlight was getting my books signed by Libba Bray. Because things were happening at the same time, and signing lines for some authors were huge (I thought poor Rainbow Rowell’s hand was going to fall off), Libba is the only one I had a chance to really talk to. She’s really nice! Just like I thought she would be! Couldn’t actually take a picture with Libba, since they were trying to keep the line moving, but she was there! But what was really nice was being completely surrounded by people who were just as excited about the things I love as I am. These were people who stay up all night because a book won’t let them go to sleep. They have cried many times over the plights of their favorite characters. They revere these authors who have created these wonderful places to inhabit for a time, whether to escape our boring lives, or to finally find someone who understands something they are going through. And of course, the fact that I could go with my good friend Robin was just icing on the cake. So please go to YALLFest next year. And if you do, let me know so I can say hi! 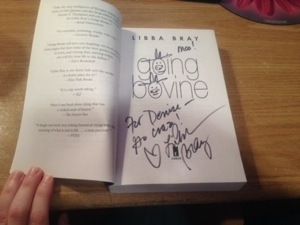 Just in case you wondered, Libba will draw cow faces if you get her to sign a copy of Going Bovine. I was only in one signing line, the one for Libba. I spent most of my time at panels. Tried texting you to try and meet up, but sometimes my phone doesn’t want to send text messages. And yes, I will definitely be going next year. No question.